As reflected by the EPA’s TMDL (Total Maximum Daily Loads), Baltimore City has a very real trash problem. For a wide variety of socioeconomic reasons, litter is thrown on the streets or often tossed directly into storm drain catch basins. It could be because people simply don’t think about it, don’t care where their trash ends up, or perhaps they believe there is a magical filtration plant removing trash before it reaches waterways. Broadcasting a message that compels people to change their behavior is a tricky task, but simple and straightforward is often the best way. Blue Water Baltimore has been helping neighborhoods paint their storm drains with slogans like, “A Healthy Harbor Starts Here” and “Trash in the Street Pollutes What We Eat” with paintings of fish, oysters, and, this is Baltimore after all… lots and lots of crabs! It’s a clever idea and BWB could use your support to make these things happen — so check out their video below and click here if you’d like to support the Storm Drain Stencil Share. The City of Reno recently launched a public art campaign to draw awareness to the dangers of pollutants in our storms drains and Truckee River. We needed to point people toan educational website, http://www.tmstormwater.com. A local artist, Bryce Chisholm, was commissioned to paint characters on two downtown storm drains. 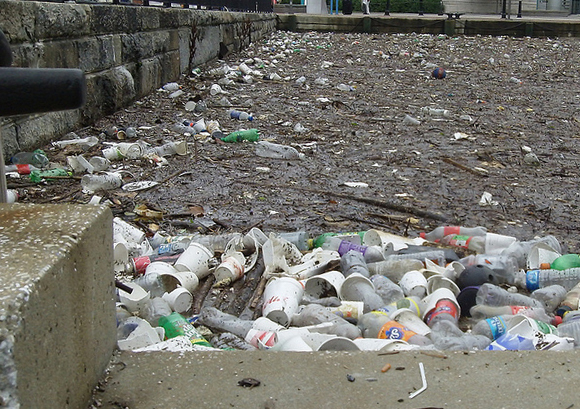 The campaign perpetuates storm drains as the mouth of the river. As in, we wouldn’t put radiator fluid, oil, or glass in our mouths, so we shouldn’t put them in the river’s mouth. The campaign has been cataloged with the following video link, check it out. http://youtu.be/-obqC450nc8.